With Westlife, Simon Cowell was finding a way to broaden the appeal of male vocal groups, and create something more stable than the firework appeal of the traditional boyband. But the old model was resilient, and more to the point, it was still astonishingly profitable. Britney Spears – who shared songwriters and producers with the Backstreet Boys – had seen her early solo aspirations dismissed as a needless risk: lone stars were finished, groups were the future. And this was why: the state of the pop art, number one worldwide, a band ascending into an Imperial Phase. The British audience was at least mildly resistant – the Backstreets had several big hits, which was more than Lou Pearlman’s other money-spinners generally managed, but they mingled with plenty of less slick homegrown options. “I Want It That Way” is their only UK number one. In one way this is a shame – the Backstreets were at their most endearing on their upbeat hits, like “Everybody (Backstreet’s Back)” and “Larger Than Life”. Those tracks had Max Martin taking the hammer chords he used to intense, melodramatic purposes on Britney’s hits, and being more playful with them. They are boyband pop as a vaudeville romp, urgent and exciting but goofy too: more, well, boyish than the group’s best-behaviour balladry. “I Want It That Way” has never quite delighted me as much. It’s one of those songs, like “Back For Good”, which was rapturously received by critics for its craft, as likely to win a design award as a teen choice one. In the hubbub of 1999 – a lively, crass year in pop music – I read its clean-lined simplicity as inertia, and admired it without ever really liking it. Now it’s grown on me. The ambition of it seems a little clearer – this isn’t so much generic as platonic, Max Martin and collaborators reaching to make the perfect boyband ballad. Which they do, cleverly, by smashing the boyband ballad into fragments. Most of these things stumble because the ways they find of expressing the same set of emotions – fidelity, puppy love, pained devotion, et al. – are meagre and shopworn, and the ideas run out long before the record does. The genius of “I Want It That Way” is in how it avoids this problem by – as pointed out by comedians ever since – simply not making any sense. It takes the idea that nobody really listens to the lyrics completely seriously, constructing a song that is meaningless at a textual level and absolutely blotted with sentiment at a textural one. “I Want It That Way” assumes, rightly, that you enjoy hearing these men harmonise around that title, and simply arranges itself to give you the maximum possible opportunity to do that, with slightly different emphases each time but no regard for whether all those swoonsome moments fit together. In between, the gaps are filled with a melange of phraselets that don’t fit whatever story the song is telling but which all sound fantastic sung, fist clenched on chest, by a handsome boy. “Fire….desire”, “you are you are you are”, “don’t wanna hear you sayyyy!”, “it’s to-oo-oo late”, all given their own lovely micro-hook and thrown into the song’s rising tide. The result is a single that I got wrong at the time – its deceptively simple framework hides a wealth of detail, and it’s arranged so that most of the big payoffs come in the final minute. Where most ballads are wheezing and gasping for fresh ideas, “I Want It That Way” is on a victory lap. I don’t know – I mean, I love the expression “melange of phraselets”, but it reminds me of why I don’t like Oasis, just random hooks glued together (like the fictional Julia Roberts film “Love is Nice” in the Simpsons – “Radical! Is that your final answer?”) in the hope that it all comes off. I disagree that it does although the glueing is of substantially higher quality than Don’t Look Back In Anger. 5. I think it works in a very similar way to Oasis – that’s a fertile comparison! This particular week in 1999 arguably marked the peak of the boy band era with the Backstreet Boys at one, Westlife still at two and 911 at three. It’s worth noting that Private Number was 911’s last top ten hit and while I Want It That Way marked Backstreet Boys’ zenith their imperial phase would soon be over. While they almost maintained a 100% top ten strike rate until 2005 (one song stopped at 12 and they were inactive between 02 and 05) their better known songs were generally behind them. Given that they were one of the most consistent pop acts of the 90s they seem to be almost forgotten now and indeed less regarded than N*Sync (bigger over the pond I think but erratic hitmakers here) – possibly because they never spawned a solo star. Its a great song if you are in a good mood. And Tom, today, clearly is. This is a perfectly decent song in its own write, but the demands (or expectations? or assumptions of the expectations?) of the market result in some familiar bugbears which compromise it: the key change after the middle for the last choruses, inhuman programmed drums, and a very perfunctory-sounding lyric. That, plus the fact that the singing is earnest rather than passionate, makes it sound like a typical late-20th century cover of a song which in its original incarnation would probably have scored two points higher. Otherwise, SIX. Thought: the idea of a boyband ballad really doesn’t make much non-commercial sense anyway – it’s kind of ridiculous to have four or five guys simultaneously singing a love song to the same person! Westlife work around that trope with unison singing; Max Martin and friends went straight for all-out subversion. Of course, the result was itself ripe for mockery, but how many comedians – before or since this record – noticed the mockery potential in the basic conceit of the boyband ballad in the first place? I suspect “but it’s actually five blokes” is to boybands as “but it’s a bloke in a rubber suit” is to Doctor Who – the fans happily look past issues of verisimilitude as long as they don’t get really glaring. What would really glaring for a boyband hit look like? One of the remaining thirteen Westlife hits gets there, I think. After Boyzone and Westlife, I get the feeling IWITW is a refreshing drink of water in a moribund boyband desert, but that doesn’t make it any good compared to “Everybody (Backstreet’s Back)” and “Quit Playing Games (With My Heart)” which are incredibly catchy, in a friendly earworm sense. They are pretty enjoyable pop songs with hooks aplenty. IWITW for me, just falls short of the standard set by their other hits, but is still streets ahead of the Irish Model, even with the lyrical inconsistencies. Continuing our themes from last time: still massive in China in 2014. Bit better disposed towards this – listened to casually it’s a big, polished pop tune with bags of hooks, but unfortunately when actively observed it’s a whole load of content-free-signifiers stitched together into, what, a series of sounds that go together with a video, nothing much more. A shame we’re not talking about Everybody (Backstreet’s Back) as that seems to be comprised of something beyond vapour. Also – can someone explain why this backtreet boy is wearing this outfit in the video? it really can’t be to appeal to teenage girls. This is definitely a superior piece of boy-band music, and indeed of pop music more generally. I’d also make the case that (having just scanned through all their hits -probably only three or four of which I recognized or recalled hearing previously) that this was pretty much the best of them – a rare case where “the sole number one from a band that had a fairly substantial take of reasonably big hits” is probably the one that most deserves it. All the singers get to showcase their talents here. And the song is pleasurable, if incoherent, and comes to a conclusion, too. At least a couple of the earlier singles sounded as though they had lifted ideas from elsewhere; and there seemed to be a pretty strong drop off in quality pretty soon after this one – I suspect fame and the adulation of fans evident in this (“Kisses for Kevin”) and other videos having gone to the heads of, if not, necessarily the band, certainly their management – the trick of using expensive and themed videos to try and cover up for weaker compositions was evidently in play for “Larger Than Life”, at least. This increasing variability in quality was, admittedly, combined with a greater experimentation in styles, some of which worked, some of which didn’t – before a rather hideous and frankly mistaken turn into Gary Barlow-style balladeering (with a slightly more expensive variant of Barlowesque synthesised backing music when we reach that point, too) , which frankly was hideous. On the humourous videos and dressing up, fronts, though, the promo for their final top 10 hit, “Just Want You To Know” (from 2005) is, as well as being entirely surprising, hard to beat https://www.youtube.com/watch?v=EDvRs3SceGo – and makes me think a bit more kindly of the vaguely macho posturing evident in some of the earlier videos. Although, after a spell of Westlife, perhaps “macho posturing” is overstating the point a bit – but the Backstreets evidently had a similar kind of swagger (if greater talent) to that of New Kids on the Block, rather than any British or Irish boy band of note from the previous decade. What about three? I have in mind Crosby, Stills and Nash harmonising Steven Stills’s paean to Judy Collins. A whole universe away from Pondlife but much the same thing nonetheless. I hadn’t realized the Backstreet Boys had managed a UK #1, something they never accomplished in the US. This reached #6 here. I think I mentioned in a previous thread that BB, along with compatriots NSync were much bigger on the US album chart than the singles chart…although NSync did get a single #1 with “It’s Gonna Be Me” in 2000. The best BB could do was taking “Quit Playing Games” to #2 in 1996. I have a childish habit of changing the lyrics to popular songs. 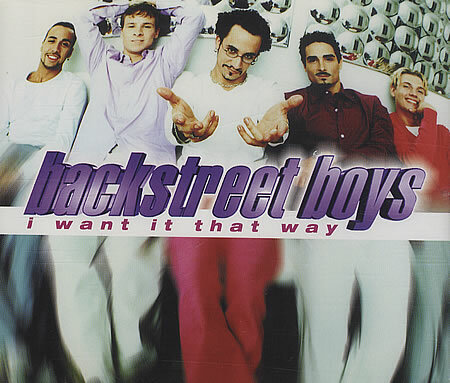 So for me the lyrics “I want it tha-at way” became “why won’t the Backstreet Boys go away?” Silliness aside, the song actually wasn’t that bad, in fact, my lyrics change demonstrates its inherent catchiness. All in all, BB, NSync, and fellow travelers 98 Degrees may not have been aimed at me, but the song quality and production values were generally pretty high and were a big improvement over the days of NKOTB and to be frank, better than anything I’ve yet heard from contemporary British and Irish boy bands, with the possible exception of Take That who weren’t exactly contemporary by this point. Anyway, I don’t like this quite as much as Tom, but I’ll still give it 6/10. The somewhat lukewarm reaction to this made me check to see if I’d overstated the level of critical acclaim it got at the time. And no, well not really – there it is in the Pazz And Jop poll for 99 at a more than respectable #5, the highest rated UK No.1 on the list – “Baby One More Time” is down at #20, with “Praise You”, “Believe” and a brace of bunnies lurking in between. Some of it is the distorting weight of presence, of course – as noted above, the BBs were MASSIVE album sellers in America. Now THIS is how you do a boyband song. It gets lovelier with every passing year and is miles better than Backstreet’s Back. “Am I sexual? Yea-ah”. No, I’ll stick with this one thanks. Clearly superior to the Boyzone and Westlife number ones we’ve heard so far. Even though it isn’t about to reverse my general antipathy towards boybands, I’ll still go a 6. Did no one from Backstreet Boys have a solo career? How odd. I was reminded of a minor Boyzone solo career on (cough) Popmaster this morning, a Boyzone member I literally don’t think I’d ever heard of. Here’s one I didn’t remember as a no.1 (blink in ’99 and the chart was so radically different) but, like other commenters, I was most pleased to discover it had made it onto Popular. IWITW is faultless structurally, with a couple of neat unexpected changes, decent vocals, Don’t Look Back In Anger-esque meaningless trigger lyrics, and a production that’s airtight in all the places where Boyzone, Westlife and 911 are flabby. 9 from me. An ex-boyfriend once accused me of liking the Backstreet Boys “ironically”; he got an earful about that. #19 Nick Carter was considered the best solo prospect, going in a light rock direction. I think he had a bit of success in America – you might consider him an early example of an artist with more fan visibility than chart impact, like the Conor Maynards of today. I absolutely hated this song as a kid, I think it seemed sleazy, self-centred and demanding to child-me, still kinda does. It’s obviously really well made as a pop song. The key-change can give me chills if it catches me at the right moment, and I love some of the ad-libs at the end, and I like the idea of its structure as a cascade of hooks. The mixing (production?) does seem flat though, like a lot of Backstreet songs to my ears. I also think this (and other backstreet songs) are central to what the idea ‘pop song’ means to me; which makes me dislike it even more in someways because I couldn’t connect with and respect ‘pop music’ for such a long time (regardless of loving Huey Lewis and Celine Dion as examples). I can see the metal influences though I can’t articulate why. I’ve been coming up through the archives and I would pick Westlife, Perfect Moment, and definitely Flat Beat and …Baby One More Time before this. I just have such a strong aversion and revulsion reaction to it. Maybe 3 at most? Homer: Okay, last question. Who is your favorite Backstreet Boy? Lenny: Oh! The little rat-faced one. Unusual that they were bigger in Europe to start with but Boyz II Men were the heavyweights in the US werent they? With the success of the Irish groups this was like a ‘we havent gone away you know’ re-emergence after a brief quiet spell. We got It Goin on was a favourite of mine in 96 but they lost me with 97’s more of the same type balladry with exception of the terrific Everybody (Backstreet’s back). This was a bit too syrupy for my liking and I’m very surprised at the 8 mark given the hostile reception to popular 99 boybands so far but Pazz and Jop 99 has this as the 5th single of the year so it has its fans. This felt like a clutch of boyband cliches rolled into one.Sentimental tune, Men pointing to their chest to show emotion, the odd dance move, screaming audience. It goes on. Larger than life was ace though. Possibly 1999’s biggest guilty pleasure.Would have been a 7. The song is great and easy to listen to and when BSB finally came through on their potential for me.